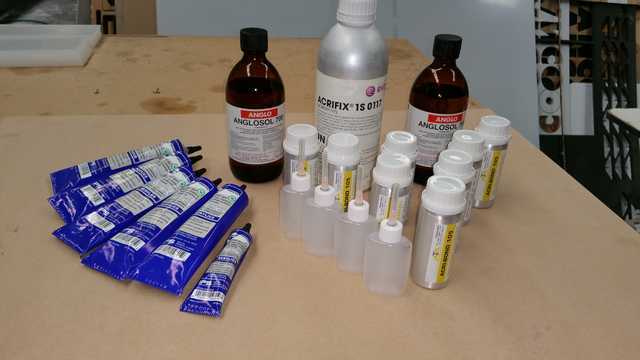 Acrylic Adhesives for sale in Melbourne call for free advice. Industrial Plastic Solutions sells different types of Acrylic Glues and Acrylic Adhesives to the general public and Signage Industry. All adhesives are sold with a Material Safety Data Sheet. If you need to glue thick panels or even thin panels we will have the right adhesive to bond your acrylic for that expert finish. Weld-On 16 is of a thick runny clear consistency that is a specially formulated cement to bond Acrylic. Once fully cured is has excellent strength properties. It can also be used to bond Polycarbonate, Styrene, Butyrate, and PVC, including other types of plastics. Weld-On 16 comes in small tubes 44ml & larger tubes of 146ml. It is a good all round acrylic cement where you need strength in your glue joins. Being water thin the Acri-Bond 105 acrylic adhesive is great for all types of Point of Sale Displays & acrylic bonding needs. We not only sell the cement but also provide a needle applicator to give you the expert glue finish that we here at Industrial Plastic Solutions provide to our customers. Anglosol 700 cement is a two part acrylic adhesive. It is of a thick consistency and provides a great high strength glue join, great for fish tanks. Cure time takes 24 to 48 hours for full strength. This type of acrylic cement is specifically used for outdoor applications such as signs etc. When we sell you Acrylic Adhesive we will show you how to use the purchased adhesive. We will also give tips learned over many years of Plastic Fabrication that will help you complete your application. Click here to watch an instructional video on how to glue acrylic.